Home | Materials | Where Is Stainless Steel Pipe Used? With so many different products like seamless pipes, welded pipes and flanges it might be overwhelming trying to pick which Stainless steel pipe to use for your business applications, or even what they can be used for in the first place. There are many different properties of each pipe that give it a unique use in its respective industries, and if you’re going to master the different types of piping materials and what they’re used for, it’s important that you learn the different types, what they can be used for and how they can be applied to various industries. To give you a hand, we’ve put together a simple article that details most of the regular uses for Stainless steel pipe, why it’s used and how it could be applied to a generic industrial company. First, let’s dive into the many different types of stainless steel pipe so that we can judge which types to use for each different scenario. A seamless pipe is a pipe that does not contain any seams or weld joints. It’s capable of standing up to intense levels of pressure and also temperatures thanks to the metal itself. It’s used in a wide variety of different oil and gas applications, but they are also used in mechanical and engineering industries too. This makes seamless pipes rather versatile and they are always inspected with high levels of precision to ensure the quality of the material. Welded pipes can be used in virtually every industry thanks to its flexibility. However, they fare better in corrosion resistance as opposed to withstanding pressure. 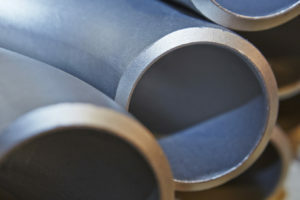 Because of the materials used and the lightweight nature of welded pipes, they’re far more cost-effective than most other piping methods and offer the best value for your money. Pipe flanges are another important part of your overall piping setup. These come in many forms such as slip-ons, blinds, lap joints, threaded and semis. These are made from durable and sturdy materials to ensure their reliability and high-quality products are always used when creating pipe flanges. For permanent or long-term solutions that allow for isolation of piping sections, spectacle blinds, spades and spacers are used for convenience. If a piece of machinery or piping section needs to be inspected, then spectacle blinds are used so that you can isolate a certain part of the piping in order to maintain a larger system. Since this is an incredibly important role that is crucial to your safety, it’s recommended to rigorously test the reliability of your spectacle blinds if you want to remain safe. Given that each use case is different, it’s recommended that you speak with a professional first before investing a lot of money into spectacle blinds. Now we’ve taken a look at the different types of steel pipe on offer, let’s look at the industries they are used in. Technology plays a massively important role in the oil and gas industries. The need for corrosion-resistant piping has increased over the past couple of years as the depths we explore for oil deepens and more pressure is being placed on the duplex and super duplex stainless steel pipes we use. These harsh environments can be incredibly corrosive and if the damage is left unchecked, the pipes would easily burst and become unusable for deeper depths. This is why it’s important to have sturdy pipes in the oil and gas industry and how it plays such a huge role in the success of this industry. Obtaining usable energy from atomic nuclei is no easy task. All of the nuclear reactors we use today heat water to produce steam which is then used to spin turbines that provide us with energy and most of them are placed near the coast due to the cooling requirements. As such, much of the water being pumped in to cool down these reactors is from the sea, and it needs to be resistant to the corrosive nature of seawater. Stainless steel pipe is more than qualified to defend against corrosion from seawater, hence its importance in the nuclear power industry. LNG (liquefied natural gas) is gas that has been temporarily converted into a liquid form for the sake of transportation. Its volume is greatly reduced to make it easier and cheaper to transport. In some cases, transporting natural gas via pipelines isn’t possible or cheap enough to be worth the cost, which is why it’s instead transported via a liquid form in cryogenic sea vessels and road tankers. As such, it’s important to have the right piping that provides safe and economical LNG transport to deliver natural gas to parts of the country or world that are difficult to reach. Desalination is the removal of salt and other minerals from a source of water. This is done to convert water into fresh water that is fit for humans to use or possibly irrigation. In most cases, salt is created as a by-product and desalination are used on many submarines and ships. Today, desalination is typically spoken about when attempting to bring fresh potable water to regions of the world where it is difficult. Saltwater and metals generally don’t mix very well, hence the importance of getting piping in the desalination industry that is able to withstand the natural corrosive properties of salt water. Mining is the process of extracting materials from the earth. The materials covered are usually in the form of metals both common and precious and it’s something that has been done for thousands of years to acquire beneficial resources. The mining industry is one where stainless steel has made it easier and more profitable to take on larger operations. Whether it’s used in the actual mines itself where workers and machines dig at the earth, or in the bunk beds and mess halls where staff sleep, it’s used in a variety of different applications to provide safety and reliability.